Everyone waking up this morning is now hearing about the Chip Kelly saga going a rye for the second time in as many years. This time last year he was turning down an offer from the Tampa Bay Buccaneers to be their Head Football Coach, which in essence, is the same thing he has done this year, in regards to Philadelphia. The story is very intriguing in itself, because of the “Celebrity Deathmatch” type feel it has had to it involving boyhood friends Joe Banner and Jeff Lurie. The landscape was set in the beginning with Chip Kelly seemingly being the number one choice for both franchises to rebuild their teams and fan bases. Chip Kelly was an illustrious name that would have brought a media circus to whatever part of town that landed the accomplished college coach. In other words, both Lurie and Banner, already had a separate bank account set up to count the infamous amounts of money this storyline would have generated. This is the leading reason behind both franchises willing to go the extra mile, in terms of money and responsibility, to land the collegiate mastermind. 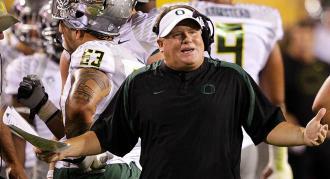 Consequently, this brings us to ponder the real reason why Chip Kelly decided to return to Oregon, to continue coachiong on a collegiate level. There are many interesting questions that could of been floating around in Kelly’s head during the whole interview process that made him hesitant to committ to the National Football League. If I accept the job in Cleveland, do I really have to deal with Joe Banner, who has a bad reputation amonst NFL playes and agents? How will I convince the players I need within my system to be successful to come to Cleveland? Does Jeff Lurie and Howie Rosman really know what direction each other wants to go into? Is the team of Eagles presently constructed flawed by a bad system, or are they just overhyped and overated? As you can see, there are many questions to ask and think about in this everlasting saga. The answers will always be unknown, but surely thorugh certain sources, will be leaked out for all of us to judge. Either way it seems as though, both franchises came away with the generation of buzz they both craved and covetted, even if, in the end they didnt land their number one option! What an interesting situation that would be if your logic was correct. I do remember the stories aired in the offseason of Jon Gruden spending time at the Novacare Complex. Are you saying the Eagles are not saying the truth? We have definitely seen many smoke screens from this regime in the past. yes, that’s exactly what im saying. just like todays story about interviewing Brian Kelly,,,, smoke screen.